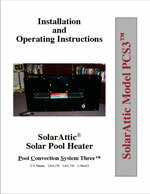 All SolarAttic solar pool heater products come with a 100% performance guarantee. You can count on the fact that we back our products with the confidence that we know they will work for you. The solar pool heater performance guarantee requires that you have a sunny roof (i.e. not normally shaded) and an attic that actually does build up heat. If you are one of those creative geniuses that have eliminated all of your free solar-derived attic heat, you will have to reverse your ventilation techniques. Your hot attic can now save you a lot of money by reducing your energy costs. Our performance guarantee applies to solar pool heaters purchased directly from SolarAttic and to the original end user purchaser only. If you are purchasing this product through a dealer, please contact the dealer for all warranty and performance information. Call us if you have questions about your attic's heating capabilities. All SolarAttic attic solar pool heater PCS model parts and workmanship are covered for 36 months from date of shipment to the original purchaser. Separate warranties cover all solar control units or valve assemblies shipped to support the solar pool heaters manufactured by SolarAttic.